The early Californio culture was so filled with class and style. It was a brief period of about 50-60 years. It was a period rich in tradition, love of the land, the horse and the cattle. The vaquero of this period took great pride in his work. Their love of fancy saddles, silver mounted gear and flashy dress is still carried on today. The ranches of the Great Basin found their roots in this Californio period. Little art has been created about this period. 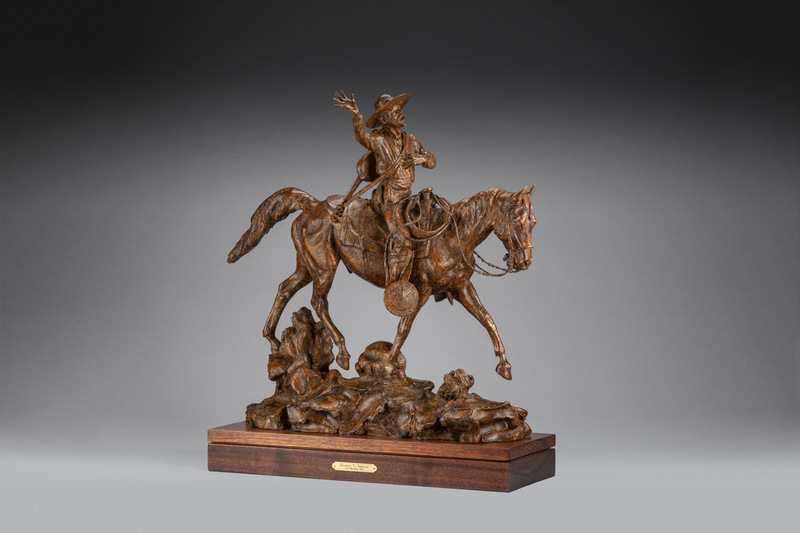 I’m looking forward to sculpting other pieces that tell the stories of this wonderful heritage of the West. In this piece we have a vaquero on his very best horse and he has a very special mission in mind. In these early Californio days of the great ranchos, courting a girl was a very formal affair. This vaquero has his eye on a particular señorita and so he is off to pay her a visit. His horse is a finished spade bit horse. A Santa Barbara spade bit is in his mouth, and a bosalita with braided rawhide noseband is under the bridle. The Mecate rope tied on the bosalita and then tied to the saddle. This rope is of twisted horse hair and is used by the rider to lead the horse. Today we call them “get-down” ropes. The horses bridle is adorned with silver conchos and the reins are braided rawhide. The saddle the vaquero rides is a center fire saddle, meaning it has one cinch. 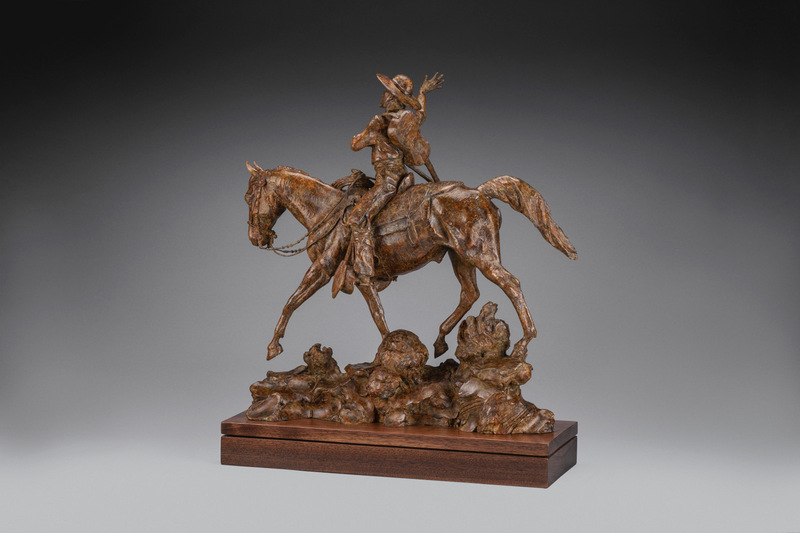 His stirrups were carved of wood 4” in width. This saddle has a very unique style of tapadero as used by the early vaquero. The circular shape and slight cone from the middle outward made these very stylish. They were often carved with elaborate designs by the vaquero. The vaquero of this period made the saddle as well as most of his gear as wages were low. However he was very proud of who he was and what he did. The covering on the top of the horses hip is called an “anquera”. This vaquero is looking forward to giving his señorita a ride after singing to her and is going prepared in anticipation of success. He wears a typical flat hat with an open crown, a short jacket and red sash around his waist. His short pants are buttoned just above the knee and on his lower leg are “botas”. They were a precursor to our chaps and were there to protect the leg. There is a skinning knife in his right bota, as hides and tallow were the value of cattle in those days. His big roweled spurs finished off his look. This vaquero if off to sing to his señorita at the rancho. She would have a chaperone with her and might be out on the second story veranda of the ranch house. He would be below her, his guitar in his hand, singing great songs of the vaquero and looking as good as he possibly could. This vaquero is most certainly “Dressed to Impress”.